I heard a news piece this morning about “Operation Jackhammer”. Interesting which “harvesting” techniques are legal vs. illegal. What’s fair or unfair in the practice of hunting? In this case it is night-hunting with lights. 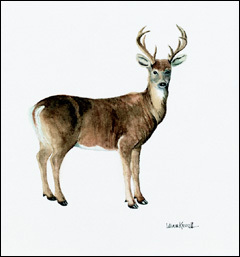 The investigation, dubbed “Operation Jackhammer,” focused on the illegal taking of deer by use of artificial light – a practice commonly known as “deer jacking.” This involves night hunting where poachers shine a spotlight on a deer feeding in fields to “freeze” the animal long enough to shoot it — killing deer when they are most vulnerable. Typically, deer jacking occurs in remote rural areas, late at night. Due to these late hours and secluded areas, there are few, if any, witnesses to this crime. It seems “102 misdemeanors and 37 violations were filed in the Adirondack Park and surrounding North Country.” While the notion of what is “fair” for the deer is debatable, I totally agree with the safety issue. I wonder what the motive is behind these illegal hunts? Is it for fun? Are they putting food on their tables? Woah…Poor deers! Hunting still exists? Com’on people…spare them. How else can we make Venison Chili? How about those decoy/robot deer that get shot up, placed there by law enforcement to catch scofflaw hunters? If someone can’t tell the difference between a live animal and an animated statue, they shouldn’t be playing with guns. I wonder if the stories I hear from locals about the deer population being more than healthy are true. (Sometimes, the story even presents the Adks as “overrun with deer.”) Wonder if that’s true. We’re not “overrun” like places downstate. At the same time, I don’t think there is a shortage. I guess the point of this post was to point out the subjective opinion of what is “sporting”. If someone was hunting to feed his starving family, does this change the ethical balance? Deer harvest was reported to be down this year. Bear up. Hate to say it, but this is actually making me hungry. If someone can’t tell the difference between a live animal and an animated statue, they shouldn’t be playing with guns. Hey I’m all for hunting. It’s better then eating abused cattle.